Jiffy international has been around since the 1950’s. This long standing company has prides itself on their long standing dedication to producing environmentally friendly quality products. These include propagation systems, hydroponic systems, growing containers and substrates. 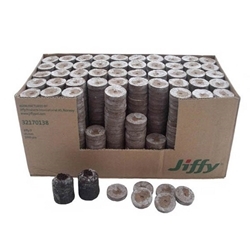 Containing just the right amount of nutrients for seedlings and cuttings, Jiffy Plugs are a great organic starter medium.